If you have noticed that you are being attacked from a specific country or simply want to deny or allow access to your website from one or more countries you can use .htaccess file to easily do that. 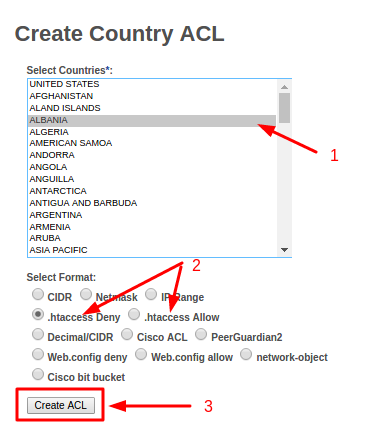 This tutorial will show how to use .htaccess to block IP of visitor from the specific country. Step 1 — Opening up your .htaccess file. 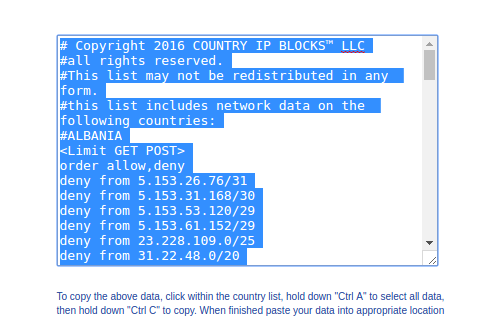 You can generate a list of IP addresses from a specific country on this website. Select a country that you want to either block or allow. You can select a list that would be ready to copy and paste directly to .htaccess file. As it is suggested on the website – to copy the above data, click within the country list, hold down CTRL+A (MAC users Command+A) to select all data, then hold down CTRL+C (MAC users Command+C) to copy. When finished paste your data into your .htaccess file using CTRL+V (MAC users Command+V). IMPORTANT! If you are no longer able to access your website check if your IP is not on the block list. You can find your own IP address at whatismyipaddress.com. This tutorial shows how easy it is to block or allow a specific country from accessing your website using an .htaccess file.